Sabra fruits for sale in a Tel Aviv Market. What's tough and prickly on the outside, but sweet and soft on the inside? Ask an Israeli, and they'll tell you -- probably with a wink -- that it's both fruit and native of their country. 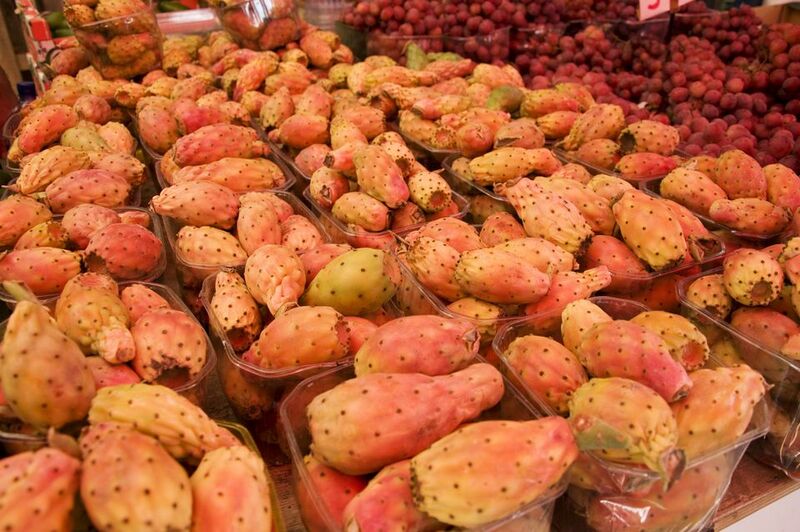 The fruit in question is known elsewhere as a prickly pear or cactus pear, and if you drive anywhere in Israel during July and August, you’ll likely see fresh sabra fruits being sold along the side of the road. Prickly pears are the fruit of the Opuntia cactus. This cactus has large flat pads (which, incidentally, are also edible), thorny fruits, and flowers that blossom annually. Sabra cacti can be seen scattered throughout the Israeli hills, where they were often planted to serve as natural dividers and barriers. While the cacti look like a natural part of the Israeli landscape, they were actually imported to Israel from New Mexico and Arizona in the 19th century, according to the late Israeli wine and food writer Daniel Rogov. While prickly pears are called sabras in Israel, elsewhere they are called Indian figs, barberry figs, and tuna. The fruit, which is rich in vitamin C, is very popular in Mexico, Central, and South America, Mediterranean countries and parts of Africa. In recent years it has gradually become more popular in the United States. The outside of prickly pear ranges in color from green to purplish-red. The inside of prickly pear ranges in color from light yellow-green to deep golden. The fruit’s flesh is soft, porous and scattered with black seeds. Prickly Pear Syrup Recipe​ -- Try this simple, two-ingredient syrup in cocktails, or as a base for sorbet. Prickly Pear Jelly -- This photo-illustrated step-by-step recipe walks you through the jelly making process, from (safely) removing the prickles, to jarring the finished jelly.